So my last recipe was for Banana Peanut Butter Breakfast Muffins, now I am moving on to Banana Peanut Butter Frozen Yogurt. I usually have both bananas and peanut butter on hand, so that makes it handy for recipes. It’s also really cheap to buy the “red-band” almost too ripe to sell bananas at that grocery store. The five bananas I used for this recipe cost less than 50 cents! 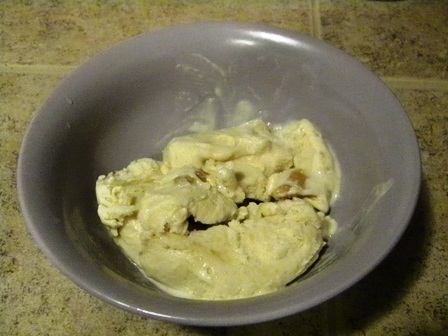 This is similar to the Banana Walnut Frozen Yogurt I made a while back, but this time I’m using low-fat yogurt and adding peanut butter (no walnuts). So as much as I love the yogurt made with whipped cream and half & half, you can’t really eat that all the time. Whole milk yogurt is also very good for frozen yogurt. This time I decided to cut the fat even more. I made my yogurt with 2% milk. Lower fat yogurt is not quite as creamy, and slightly more tart than the higher fat, but it still makes a good frozen treat. Strain yogurt for 24 hours. This should yield about 3 cups of strained yogurt. 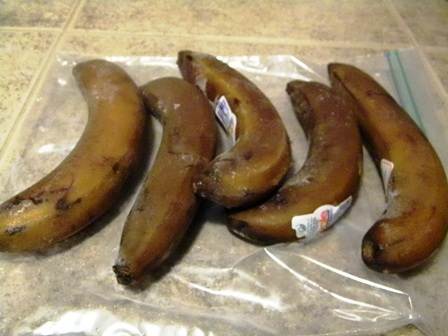 The day before you are making the yogurt throw the bananas in the freezer – just place in a freezer bag. No need to peel them or chop them. Remove the bananas from the freezer in time for them to thaw completely before making the yogurt. I froze my bananas in the morning and then took them out of the freezer at night so they were ready to make the frozen yogurt the next morning. Use a stand mixer with the flat paddle or a blender to combine all the yogurt ingredients. Place in ice-cream freezer and process according to manufacturer directions. While yogurt is churning combine the peanut butter with the honey. When yogurt is done scoop it into a large bowl. Quickly spoon small balls of the peanut butter on top of the yogurt. Gently fold in so the peanut butter spreads throughout the yogurt, but does not combine with it. 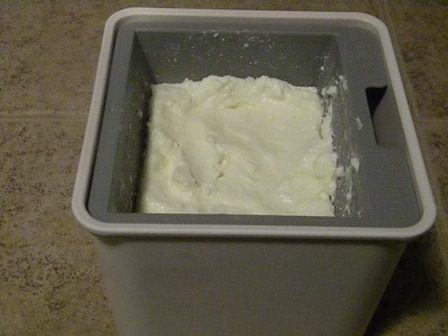 Pour yogurt into container(s) and freeze. This recipe also being shared on Slightly Indulgent Tuesday.